The Skinny: Bittersweet true story of a young boy who goes to Thailand to become Japan's first elephant trainer. Although a bit simplistic and predictable in execution, the film is enlivened considerably by strong performances from actors Yuya Yagira and Takako Tokiwa. The elephants are pretty entertaining as well. A fine debut for director Shunsaku Kawage. Based on a true story, the oddly titled Shining Boy and Little Randy stars Yuya Yagira in his first role since winning the Best Actor award at the 2004 Cannes Film Festival for Nobody Knows. In this 2005 film, Yagira plays Tetsu Susumu, an introspective, somewhat rebellious teen who lives with his family on a Hokkaido animal ranch. Owned and operated by his feisty mother Saori (Takako Tokiwa) and his bumbling stepfather (Katsumi Takahashi), the ranch is essentially an animal talent agency, since the family rents out their animals to television stations and movie studios to put food on the table. Unfortunately, Tetsu's unconventional home life makes him the target of constant harassment by his classmates, who claim he stinks of animals. Clearly, Tetsu's days at school aren't exactly the best days of his life. But as the family business starts to take a turn for the worse, Saori decides to take a risk to improve the situation, selling a few of her barnyard creatures in order to buy an animal she's wanted for years - an elephant! 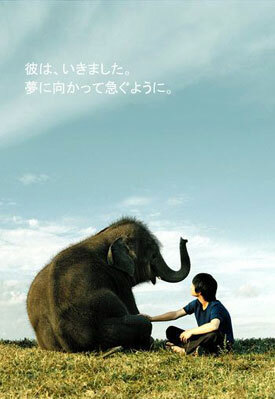 Tetsu quickly bonds with Mickey the elephant, essentially becoming an "Elephant Whisperer" with a knack for communicating with the giant beasts. Soon, a second elephant is added to the mix, but Little Randy proves to be more than the family bargained for, as Tetsu himself finds him difficult to train. A solution presents itself when Tetsu learns of a special school in Thailand for "Mahouts" (elephant trainers). After some initial resistance from Saori, she eventually gives in to her son's demands, allowing Tetsu to make the journey to Chang Mai. In this challenging new phase in his life, Tetsu must learn Thai, win over his skeptical fellow students, and tame a wild little elephant named Farr to prove his mettle. Although it's somewhat predictable that Tetsu will overcome all odds to become the first Japanese Mahout, it's still pretty enjoyable to see him accomplish this feat and also mature into a more confident young man in the process. After completing his stay in Thailand, Tetsu returns to Japan with the dream of one day establishing a sanctuary for elephants. Along the way, he develops a romance with a local girl named Emi (Aoi Yu) and tries to mend the already strained relationship he has with his mother and stepfather. The film's final act contains a dramatic turn of events that I won't spoil here, but it's important to note that a last second surprise isn't the only reason to catch Shining Boy and Little Randy. If anything, it's the performances by the film's human and non-human actors that make the film worth watching. Award-winning actor Yuya Yagira turns in another wonderful performance, effectively projecting the kind of teenage angst one would expect from a boy like Tetsu without going overboard. Similarly Tokiwa Takako does well in her role as Tetsu's mother, giving Saori a believably a tough-as-nails, no excuses way of approaching life that's refreshing to see from a Japanese actress.